Born/lived: St. Louis, MO; Woodstock, NY; Savannah, GA; Claremont, CA; Altadena, CA. 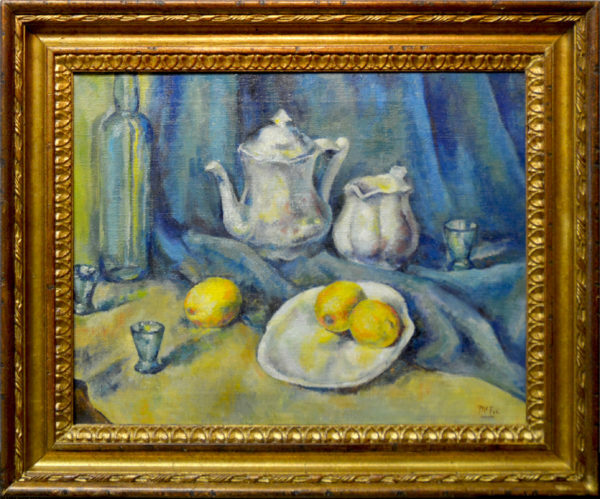 Known: as a pioneering American artist, who was inspired by Paul Cezanne (his composition and use of color) and Cubism. Studied: School of Fine Arts, St. Louis, MO; Stevenson Art School, Pittsburgh; Arts Students League, Woodstock, NY under Birge Harrison. Member: National Art Institute of L; American Society of Painters, Sculptors & Gravers; Woodstock Art Association; New Society of Artists. Exhibited: Pennsylvania Academy of Fine Arts; National Academy of Design; The Society of Independent Artist; Telfair Museum of Art, Savannah, GA; McDowell Club; PPE; Rehn Gallery, NY; Paris Salon; Virginia Museum of Fine Art; Carnegie Institute; Corcoran Gallery; Art Institute of Chicago; Whitney Museum of American Art; Los Angeles County Fair; Pepsi-Cola. Taught: Chouinard Art Insitute, Scripps College, Claremont College, CA. Positions: Started an art school in Savannah in 1939; Director, Witte Museum School of Art. Work: Metropolitan Museum of Art; Pennsylvania Academy of Fine Arts; Greenville County Museum of Art, Greenville, SC; CAM; CM; CMA; CGA; Dayton Art Institute; Springfield Museum of Art; Columbus Gallery of Fine Art; Kansas City Art Institute; Brooklyn Museum; Whitney Museum of American Art; Los Angeles County Fair College; PMG; Albright Art Gallery; Detroit Art Institute; Ann Arbor Art Association; Woodstock Art Association; Philips Memorial Gallery, Washington, DC.